In the spring of 2008, the National Guard Bureau and the U.S. Army began employing a new counterinsurgency tool in Afghanistan—Agriculture Development Teams (ADT). These specialized, egalitarian U.S. Army teams, consisting of 12 soldier-expert hybrids, work directly with Afghanistan officials and farmers to support their agricultural needs. ADTs provide agriculture-related education, training and sustainable projects, which are U.S. funded and locally operated and maintained. For the Texas ADT, geoscientists are generalists working in three areas: (a) Hydrology, (b) Education and (c) Geology. Hydrologically speaking, control, conservation and management of spring snowmelt from the Hindu Kush is vital to farming and livestock management, so delay-action dams, gabion structures and irrigation projects were developed. In response to village concerns, a dam assessment and hazard-mitigation program was developed and implemented. Team geoscientists also helped in watershed delineation and the selection of dam emplacement locations. With respect to education, university- and high-school-level support and training projects are also developed and implemented. Genuine geology-based projects were atypical due to overall security and time constraints; however, Texas ADT geoscientists completed remote sensing of chromite mineral resources in their area of operation. Overall, ADT geoscientists are essential for mission success because of their flexible approach to problem solving, which is paramount in an ever-changing battle space where data and observations are limited to time, space and support. The role of a geoscientist in these teams varies depending on the unit’s deployed location and their commander’s intent. The success of an ADT geoscientist, however, is contingent upon the commander’s understanding of what a geoscientist IS and DOES! 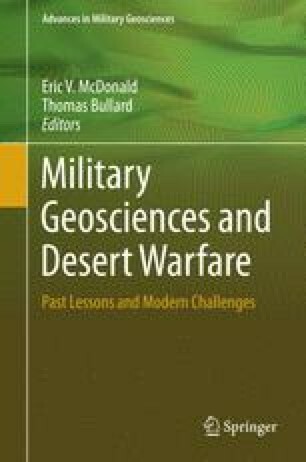 This work is the result of the author’s experiences while a soldier-geologist hybrid with the Texas ADT in Afghanistan (2009). I would like to thank Angelo State University and St. Lawrence University (SLU) for their support while I was deployed to Afghanistan and travel funds to present this work (SLU). Thank you to two anonymous reviewers for improving this manuscript. I would also like to thank, CPT Neal Litton, Texas ADT team leader, for sparking my memory where/when mine was lacking, SFC Robert Becknal and SGT Todd Plybon my fellow geoscientists and, most importantly, to my brothers in arms, SSG Christopher N. Staats (Fig. 7, left) and SGT A. Gabriel Green (right), both Killed in Action 16OCT09, Ghazni Province, Afghanistan, without whom the motivation to promulgate this work would not have existed.